I’ve been thinking, reflecting, and planning this for a long time. I bought CallofDutyBlog.com to eventually merge into this site, but as I was trying to restore the site over to my server, I went through several layers of issues. First it was very difficult to restore the skin on the site, I tried to fix it, remove something, then tried to look through files to see what was wrong. I discovered it had too many plugins that it appalled me. Instead of trying to fix it, I decided to just restore the actual posts themselves. The second thing is, somewhere along the line, I lost links. I was testing things behind the scenes. One thing led to the other, I just felt bad. I just felt this sinking feeling that there’s nothing I could do with it. I then was hit with no motivation. I wanted CODNet to become the biggest, and the most authoritative Call of Duty site on the market. At this point, there were reports that Call of Duty: Infinite Warfare didn’t sell too well, and that there were worries about how Black Ops 4 was going to pan out. 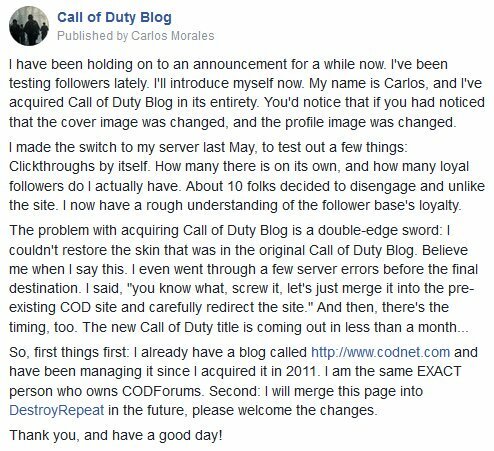 The original plan was to merge Call of Duty Blog into CODNet. The problem here is, and I learned this the hard way. Was that Google was putting a lot of emphasis on mobile indexing, and https preference. Over the summer, I turned on https, but it only had small benefits. There’s more stories behind the scenes, however, the short version is I am finding it costly for me to be buying domains and maintaining them all. I’ve been buying a lot of domains first hand, and second hand. By second hand, I’ve been buying domains in the thousands each one. Including CallofDutyBlog.com – it was my intention to become dominant in the niche. But I have other ideas. You see, I’ve been trying to contact Activision for a while now, and they shunned me through the PR agency that manages fansite, websites, and other influencer relations. Apparently, they don’t like blogs with “Call of Duty” on it. So, I’m thinking, “Since I own DestroyRepeat, lets merge all blogs into one place, and contact companies this way.” That idea stuck with me this entire year, so I allowed the blogs to sit where they are until the end of this year. The plan is to make the switch in December and open 2019 with a bang. I want to take this moment to say, THANK YOU to the readers. From the bottom of my heart, thank you for reading my articles, liking my articles, and sharing them.